Hello!!! 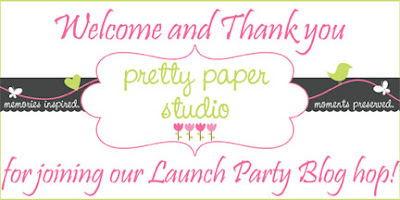 Welcome to PPS's launch party blog hop. You must be here from my good friend Irene's blog ya? Isn't her mini album just mind blowing? Sometimes I think of asking her to lend her creative side of her brain for few days. haha! If you are new to Pretty Paper Studio, you may be wondering what it is. 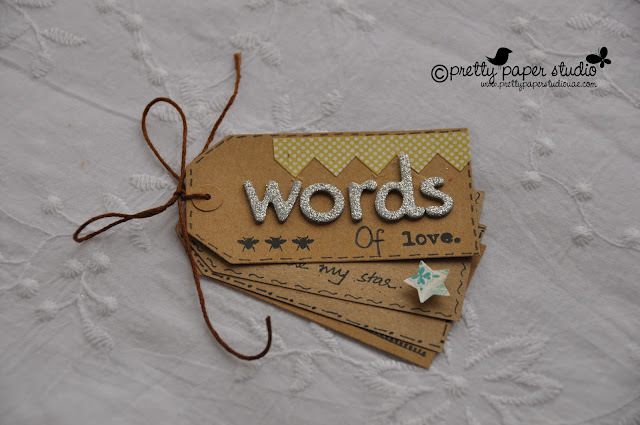 PPS is an online monthly scrapbooking and cardmaking kit club. Which means that PPS will put together a unique scrapbooking and cardmaking kit every month with project kits every three to four months. And guess what? These kits are chalk full of goodies from various manufactures at very affordable prices. PPS's shop will also have other supplies like adhesives, inks, albums, punches etc. So here are PPS's April Kits. Do you like what you see? If you do, do make sure you grab PPS's introductory offer: all kits can be purchased at a discounted subscription price of AED 205 until April 15th. 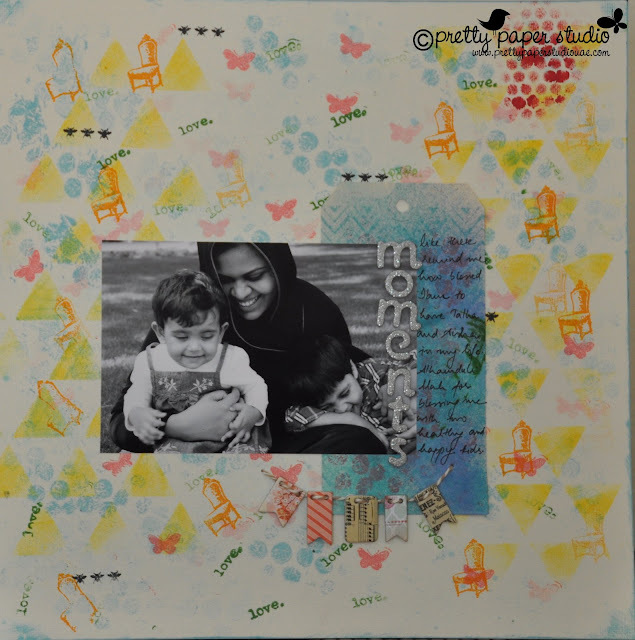 And here are some of my projects using PPS's Scrapbooking Kit. You can view my detailed post here (after blog hopping please ;). Next up on our blog hop is the STUDIO itself. Do make sure you leave comments on all the blogs on this hop as PPS is giving away TWO Spring Break Project kits and winners will be announced on PPS's blog on April 18, 2012. Here are the links to all blogs on our hop. Do visit all of them. Oh and before we forget, winner of our blog hop will be announced here on April 18th, 2012. 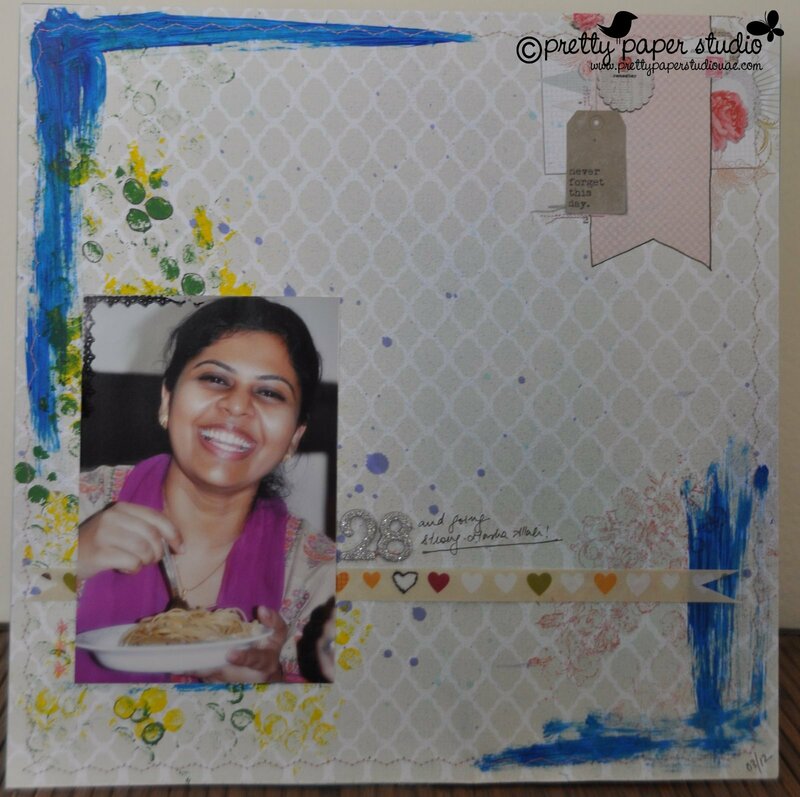 Love the LO with your pic.. Love your smile Neelu.. Gorgeous really.. and that mini tag book is really cute...!! Neelu, congrats on your launch party blog hop, a great start....!! Love your work and your smile...!!! Neelu !! First of all a big Thank You for your srapbooking series...and hearty congratulations to you on ur Kit Club Launch Party. I so love how you are able to blend mix media and photos and stamping on your pages...Despite everything, the photos still remain the focus!! Love the pages!!! Congrats!!! And I loved all the stuff in the kit!!! Loved the way you have used it!! Thats beautiful layouts Neelu. Keep going. i love your little words mini! great kit! Such fun projects all along! Congratulations Neelu and all the best for your new ventures.. all the the April kits are just gorgeous... I like the Spring one especially coz of the well cordinated colors...! Everything is so pretty! I especially love the little tag book at the end. Great little project!! Fantastic use of the kit.. it is such an amazing kit .. :) loved it! Hi neelu..have seen your scarpbook layouts..they are awesome..
Congratulations on your new venture and hope to see it reach new heights!! Love the first layout!! Gr8 way of using paint!! The kits are unique and lovely & cant wait to see more too!! wow... it looks amazing!!! thanks for the chance!!! Congratulations!! on your new venture. Wish you all the success. I loved the kit........it's so pretty!! and the projects look awesome too. Thanks for the chance to win!!!! p.s. I'm having a CANDY on my blog. Pls do stop by ! So pretty ...all the little tags and the mini album you've made with the kits! You inspire me to create a scrapbooking album for my newly born girl baby :) soon this inspiration will be put into action. Thanks for letting me blog hop, im more than glad.